One more meal in Traverse City and we’re back to pizza. Again, it was L’s birthday so she got to pick. She picked pizza. I picked the place. After lunch, we headed back to Great Wolf Lodge for some cake and a little more swimming. Once again, it was just me and L while J and B took a nap. The nap went really long. Over 2 1/2 hours long so by the time they came down to the pool, L and I were close to being ready to leave. We let the kids play another 45 minutes or so then packed every one up and headed back upstairs. Everyone was tired and it was getting close to the dance party and story time in the lobby, so we didn’t want to go out again. L suggested pizza and neither J nor I had any objections. I again went away from the in house pizza place but this time only because I wanted to try something else. There was a carry-out place just down the road, so I gave them a call. Crusted Creations is on Fourteenth Street about a block and a half east of US-31. It’s in a small strip mall with the name Hickory Corners. At 6:00 on a Sunday night, it was the only thing open other than the 7/11 in an adjacent parking lot. 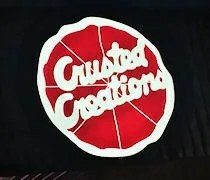 The Crusted Creations website is kind of out of the 90’s. It’s not fancy, pretty basic, and horribly designed, but it gets the job down. They don’t have online ordering which is always a bummer, but my order wasn’t going to be hard, so I just called it in. I put in my order for a large pepperoni pizza and an order of the Mozzarella Cheese Crustix. The guy taking my order asking if I wanted marinara for dipping. I said yes not realizing it was extra. He made up for it though by giving me the carry-out special which I didn’t notice on the website. That saved me a little over $5 on my order bringing the total down to a little over $15. I was told about 15 minutes until it was ready and I was about 10 away. There isn’t much to the inside of Crusted Creations other than the kitchen. There is one table with a couple of chairs sort of awkwardly placed in a very small waiting area. There’s a counter that opens up in to the kitchen. One guy was taking orders and working the front of the house. He was finishing up an order when I walked in then grabbed my pizza and stix out of a warming rack and handed them over. I asked for a couple of paper plates and some napkins forgetting we actually had some in our room this time from the cake. 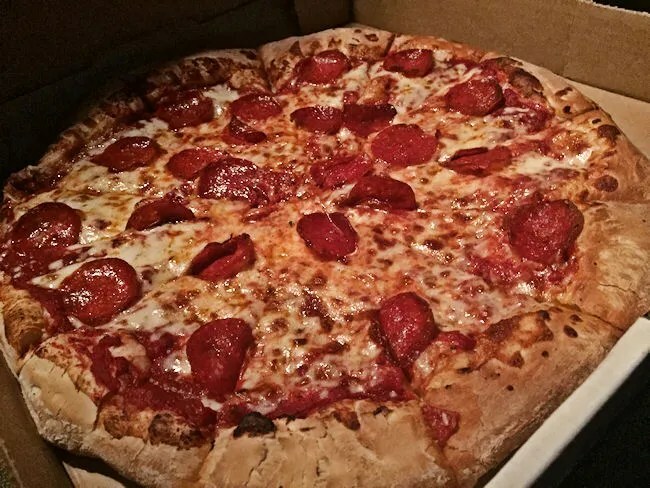 We all started with the pizza first. The large size is 14″ and there was really nothing special about this pizza. It was good. It had a good flavor, but no distinguishing features. J thought it was a little under cooked while I thought it was a little over cooked. The edge of the crust was a little hard and just sort of disintegrated when you bit in to it. J was going fro the other end and thought the point of the pizza was a little chewy. It was nothing that was a huge turn off….we still finished the whole thing. We just didn’t find anything about it that was really unique. The Mozzarella Cheese Crustix were quite the opposite. Maybe it’s our love of burnt cheese, but these were really good. The Crustix are, simply, a cheese pizza without the sauce. The cheese is piled on to the 12″ dough and baked until the to is a bubbling golden brown. These were a hit with everyone but the toddler, but he just likes to make a mess with pizza sauce and he wasn’t able to to that with the cheese bread. 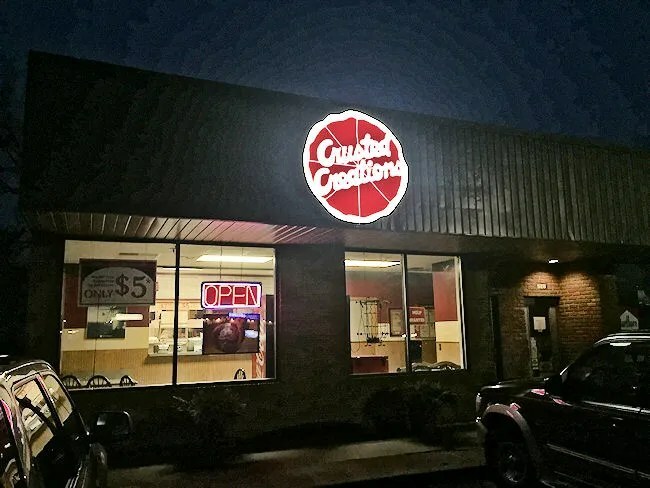 Crusted Creations is a fine local pizza joint. It’s not the knock your socks off kind of place we always look for when traveling, but they’ve been around for quite a while…30 years, so there’s a following. As out-of-towners, it’s can always be tough to judge what the locals like and for what reasons. Just because we didn’t really find something amazing doesn’t mean someone else won’t. It’s not bad pizza and the price was better than most of it’s competitors. The people were great and I appreciate the carry-out deal despite the fact I didn’t ask for.